September 1, 2015: Images taken during a MLB National League game between the St. Louis Cardinals and the Washington Nationals. 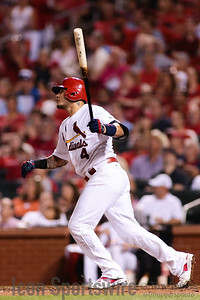 The Cardinals defeated the Nationals 8-5 at Busch Stadium in St. Louis, MO. 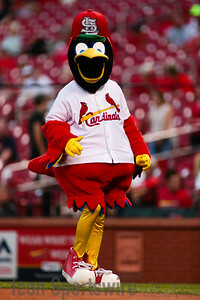 September 1, 2015: The St. Louis Cardinals Mascot "FredBird" walks on the field before a MLB National League game between the St. Louis Cardinals and the Washington Nationals. 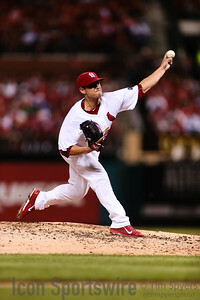 The Cardinals defeated the Nationals 8-5 at Busch Stadium in St. Louis, MO. 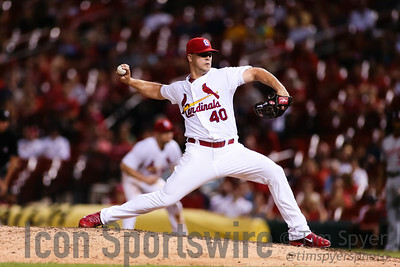 September 1, 2015: St. Louis Cardinals Starting Pitcher Marco Gonzales (56) pitches during a MLB National League game between the St. Louis Cardinals and the Washington Nationals. 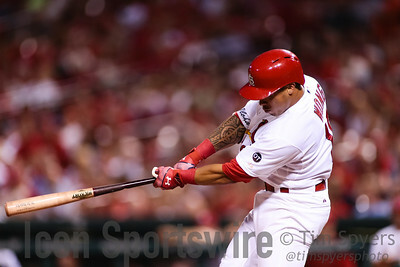 The Cardinals defeated the Nationals 8-5 at Busch Stadium in St. Louis, MO. September 1, 2015: Washington Nationals Right fielder Bryce Harper (34)  bats in the first inning during a MLB National League game between the St. Louis Cardinals and the Washington Nationals. 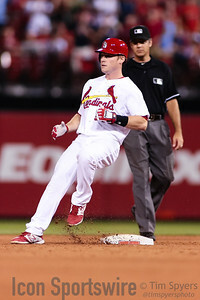 The Cardinals defeated the Nationals 8-5 at Busch Stadium in St. Louis, MO. 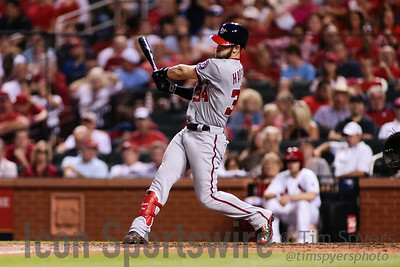 September 1, 2015: Washington Nationals Right fielder Bryce Harper (34)  prepares to bat during a MLB National League game between the St. Louis Cardinals and the Washington Nationals. 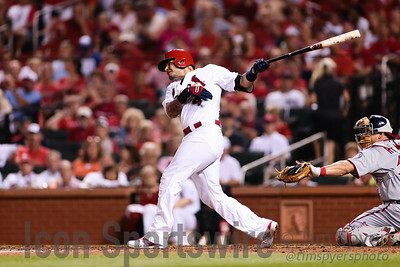 The Cardinals defeated the Nationals 8-5 at Busch Stadium in St. Louis, MO. 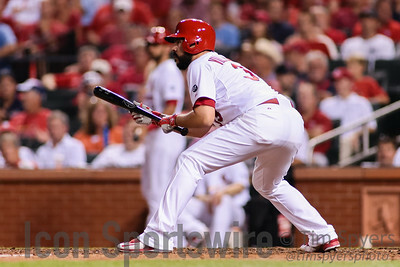 September 1, 2015: St. Louis Cardinals Third baseman Matt Carpenter (13)  bats during a MLB National League game between the St. Louis Cardinals and the Washington Nationals. 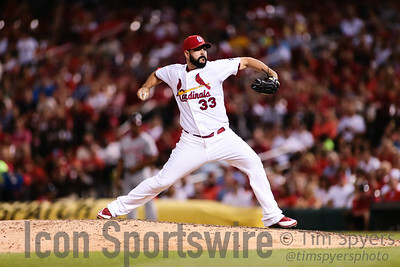 The Cardinals defeated the Nationals 8-5 at Busch Stadium in St. Louis, MO. 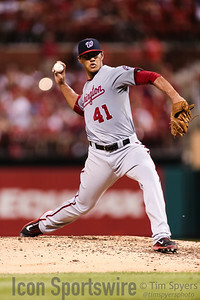 September 1, 2015: Washington Nationals Pitcher Joe Ross (41)  pitches during a MLB National League game between the St. Louis Cardinals and the Washington Nationals. 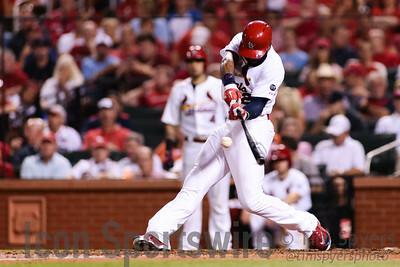 The Cardinals defeated the Nationals 8-5 at Busch Stadium in St. Louis, MO. 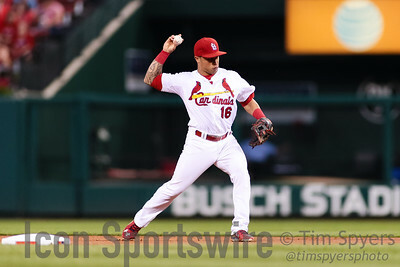 September 1, 2015: St. Louis Cardinals Second baseman Kolten Wong (16)  throws to first base for an out during a MLB National League game between the St. Louis Cardinals and the Washington Nationals. 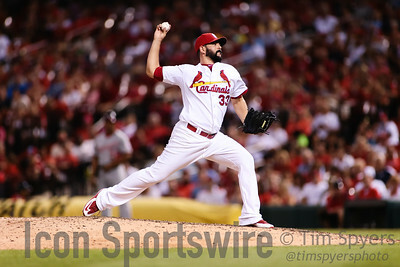 The Cardinals defeated the Nationals 8-5 at Busch Stadium in St. Louis, MO. September 1, 2015: St. Louis Cardinals Right fielder Jason Heyward (22)  flies out to centerfield during a MLB National League game between the St. Louis Cardinals and the Washington Nationals. 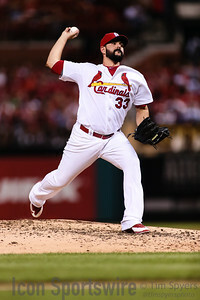 The Cardinals defeated the Nationals 8-5 at Busch Stadium in St. Louis, MO. 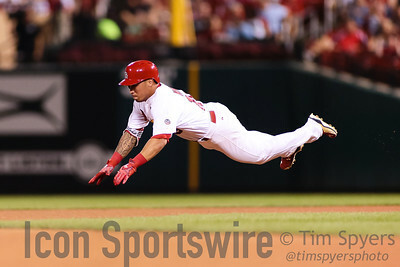 September 1, 2015: St. Louis Cardinals Second baseman Kolten Wong (16)  flies out to second base during a MLB National League game between the St. Louis Cardinals and the Washington Nationals. 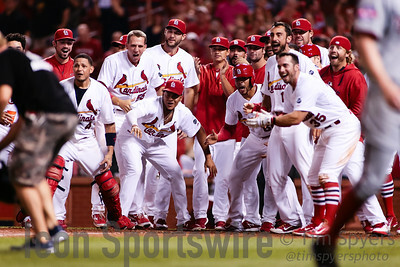 The Cardinals defeated the Nationals 8-5 at Busch Stadium in St. Louis, MO. September 1, 2015: St. Louis Cardinals First baseman Brandon Moss (21)  bats during a MLB National League game between the St. Louis Cardinals and the Washington Nationals. 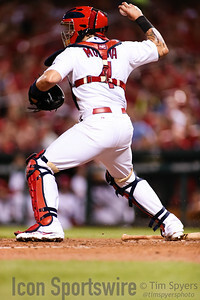 The Cardinals defeated the Nationals 8-5 at Busch Stadium in St. Louis, MO. September 1, 2015: St. Louis Cardinals Catcher Yadier Molina (4)  throws to third base during a MLB National League game between the St. Louis Cardinals and the Washington Nationals. 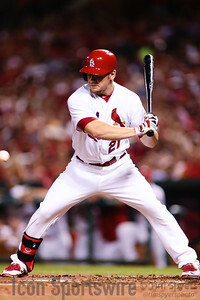 The Cardinals defeated the Nationals 8-5 at Busch Stadium in St. Louis, MO. 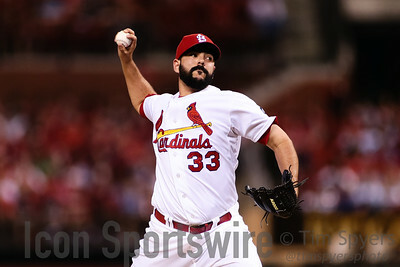 September 1, 2015: St. Louis Cardinals Pitcher Carlos Villanueva (33)  pitches during a MLB National League game between the St. Louis Cardinals and the Washington Nationals. The Cardinals defeated the Nationals 8-5 at Busch Stadium in St. Louis, MO. 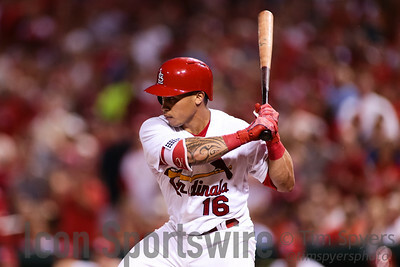 September 1, 2015: St. Louis Cardinals Second baseman Kolten Wong (16)  at bat during a MLB National League game between the St. Louis Cardinals and the Washington Nationals. The Cardinals defeated the Nationals 8-5 at Busch Stadium in St. Louis, MO. September 1, 2015: St. Louis Cardinals Shortstop Jhonny Peralta (27)  and St. Louis Cardinals First baseman Brandon Moss (21)  celebrate after scoring a run during a MLB National League game between the St. Louis Cardinals and the Washington Nationals. The Cardinals defeated the Nationals 8-5 at Busch Stadium in St. Louis, MO. 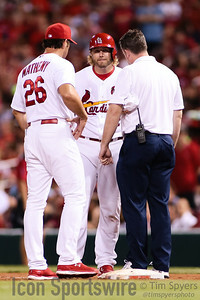 September 1, 2015: St. Louis Cardinals Manager Mike Matheny and a St. Louis Cardinals trainer look after St. Louis Cardinals Infielder Mark Reynolds (12)  after he was hit by a pitch during a MLB National League game between the St. Louis Cardinals and the Washington Nationals. The Cardinals defeated the Nationals 8-5 at Busch Stadium in St. Louis, MO. September 1, 2015: Washington Nationals Right fielder Bryce Harper (34)  at bat during a MLB National League game between the St. Louis Cardinals and the Washington Nationals. The Cardinals defeated the Nationals 8-5 at Busch Stadium in St. Louis, MO. 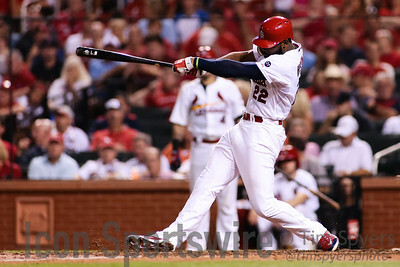 September 1, 2015: St. Louis Cardinals Right fielder Jason Heyward (22)  at bat during a MLB National League game between the St. Louis Cardinals and the Washington Nationals. The Cardinals defeated the Nationals 8-5 at Busch Stadium in St. Louis, MO. September 1, 2015: St. Louis Cardinals Catcher Yadier Molina (4)  at bat during a MLB National League game between the St. Louis Cardinals and the Washington Nationals. The Cardinals defeated the Nationals 8-5 at Busch Stadium in St. Louis, MO. 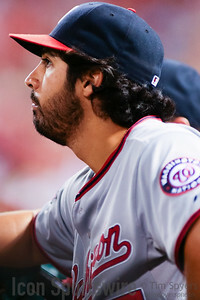 September 1, 2015: Washington Nationals pitcher Gio Gonzalez (47)  looks on from the dugout during a MLB National League game between the St. Louis Cardinals and the Washington Nationals. The Cardinals defeated the Nationals 8-5 at Busch Stadium in St. Louis, MO. 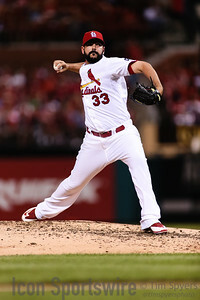 September 1, 2015: St. Louis Cardinals Pitcher Carlos Villanueva (33)  squares around to bunt during a MLB National League game between the St. Louis Cardinals and the Washington Nationals. The Cardinals defeated the Nationals 8-5 at Busch Stadium in St. Louis, MO. 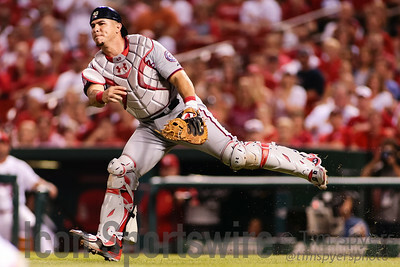 September 1, 2015: Washington Nationals Catcher Wilson Ramos (40)  throws the ball to third base on a bunt by St. Louis Cardinals Pitcher Carlos Villanueva (33)  (not pictured) during a MLB National League game between the St. Louis Cardinals and the Washington Nationals. The Cardinals defeated the Nationals 8-5 at Busch Stadium in St. Louis, MO. 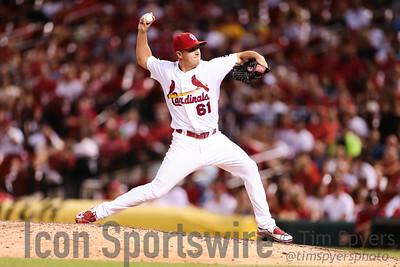 September 1, 2015: St. Louis Cardinals Pitcher Seth Maness (61)  pitches during a MLB National League game between the St. Louis Cardinals and the Washington Nationals. The Cardinals defeated the Nationals 8-5 at Busch Stadium in St. Louis, MO. September 1, 2015: Washington Nationals Left fielder Jayson Werth (28)  runs to the dugout after making a catch for the final out of the inning during a MLB National League game between the St. Louis Cardinals and the Washington Nationals. The Cardinals defeated the Nationals 8-5 at Busch Stadium in St. Louis, MO. 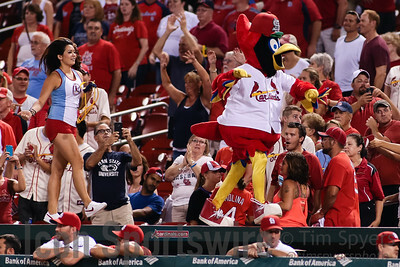 September 1, 2015: St. Louis Cardinals Mascot "FredBird" entertains the fans between innings during a MLB National League game between the St. Louis Cardinals and the Washington Nationals. The Cardinals defeated the Nationals 8-5 at Busch Stadium in St. Louis, MO. 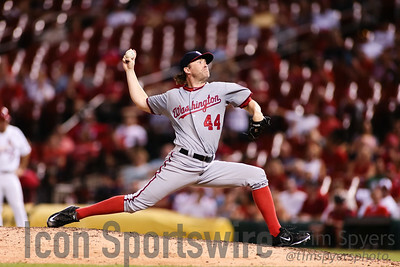 September 1, 2015: Washington Nationals Pitcher Casey Janssen (44)  pitches during a MLB National League game between the St. Louis Cardinals and the Washington Nationals. The Cardinals defeated the Nationals 8-5 at Busch Stadium in St. Louis, MO. September 1, 2015: Washington Nationals Shortstop Ian Desmond (20)  throws to first base for an out during a MLB National League game between the St. Louis Cardinals and the Washington Nationals. The Cardinals defeated the Nationals 8-5 at Busch Stadium in St. Louis, MO. September 1, 2015: St. Louis Cardinals Cody Stanley (43) gets a pinch hit double during a MLB National League game between the St. Louis Cardinals and the Washington Nationals. The Cardinals defeated the Nationals 8-5 at Busch Stadium in St. Louis, MO. 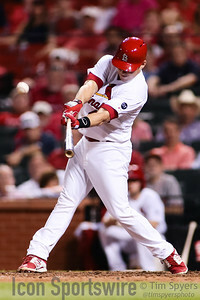 September 1, 2015: St. Louis Cardinals pinch hitter Cody Stanley (43) rounds second on a double during a MLB National League game between the St. Louis Cardinals and the Washington Nationals. The Cardinals defeated the Nationals 8-5 at Busch Stadium in St. Louis, MO. 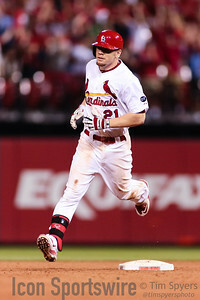 September 1, 2015: St. Louis Cardinals First baseman Brandon Moss (21)  rounds second base after hitting a walk-off 3 run home run during a MLB National League game between the St. Louis Cardinals and the Washington Nationals. The Cardinals defeated the Nationals 8-5 at Busch Stadium in St. Louis, MO. 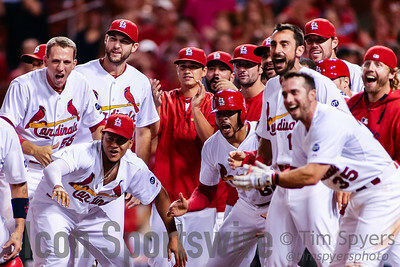 September 1, 2015: The St. Louis Cardinals celebrate waiting for St. Louis Cardinals First baseman Brandon Moss (21)  (not pictured) to come home after hitting a walk off three run home run during a MLB National League game between the St. Louis Cardinals and the Washington Nationals. 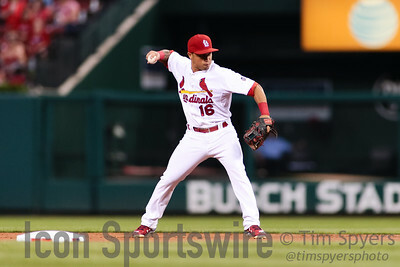 The Cardinals defeated the Nationals 8-5 at Busch Stadium in St. Louis, MO.